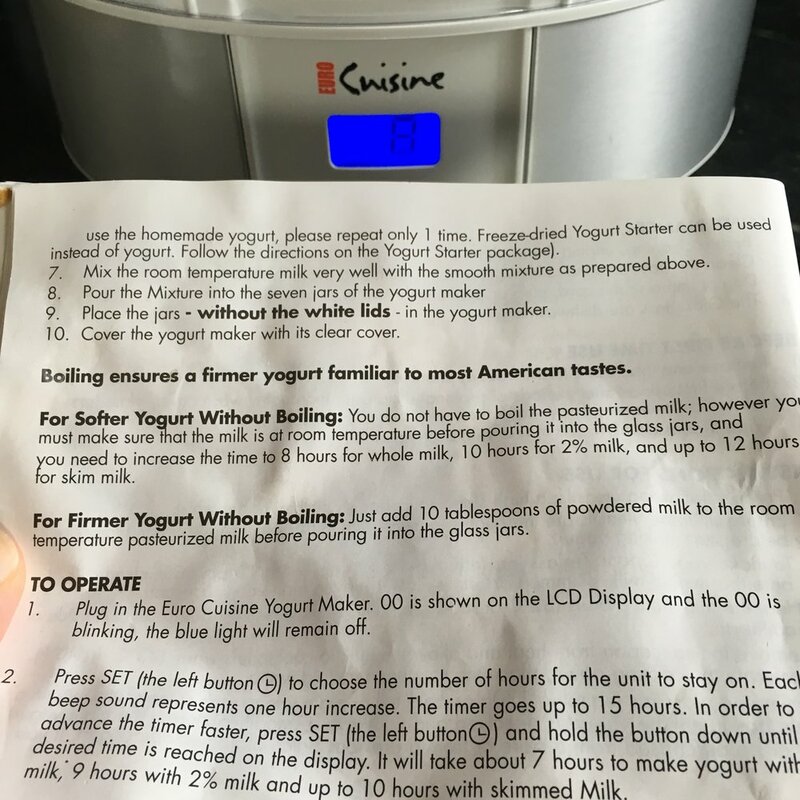 Homemade Yogurt - Is it worth it? 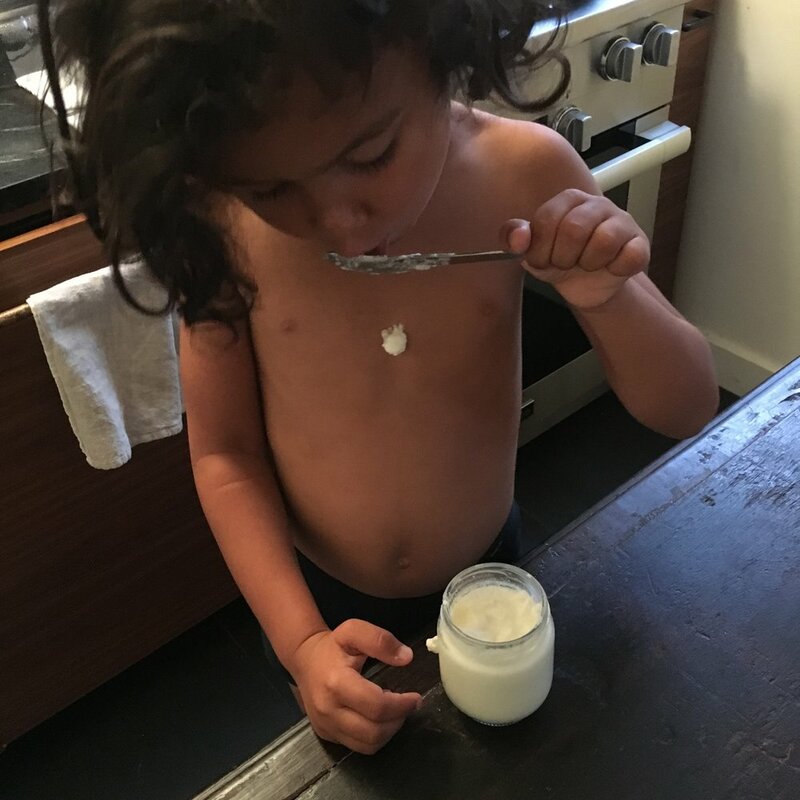 I eat yogurt everyday and so do my kiddos. It's one of those things I feel is really good for me. Plain whole fat organic yogurt with frozen blueberries, a dollop of raw almond butter or sunflower seed butter, and a teaspoon of cinnamon is totally where it's at. So very good. I've been a little turned off by all the big plastic yogurt containers we go through though, so I thought I'd revisit my yogurt machine, which comes with seven well proportioned glass cups. I have to use a carton of milk, either in a plastic container, a cardboard carton, or glass jug, so I am still left with waste, but sometimes I do find that glass milk bottle with the deposit charge, and sometimes I manage to bring back the bottle and get my deposit. I do like that most of the process takes place in glass cups, not plastic. I remember making yogurt once, only once, with my mom when I was four. It was memorable and I truly appreciate the adventure in making things that we take for granted. Frankly, it's a lot of work for something that companies do a pretty good job at, but I still want to be able to make it well. In the past I've made it alright, then failed (runny and yuckyuck), then had a success. Today I will attempt it with mild expectations of success. Make sure everything is clean. Rewash glass cups if they have been sitting unused for a while. Measure 42oz of milk and bring to a boil in a very clean pot. Let the milk rise a couple inches then turn down heat and let cool to room temperature, under 110 degrees. 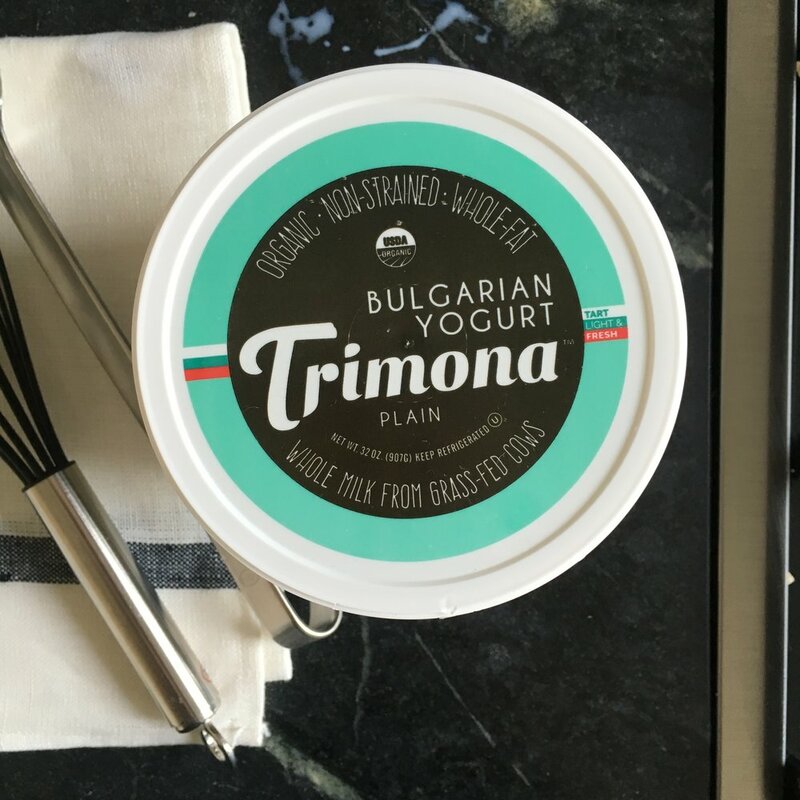 Once cool, add 6oz of your favorite plain yogurt. Whisk into the milk until consistent. Use ladle too pour into the cups. Place cups into the yogurt maker, place lid, and set to the correct hour - 8 hours for whole milk - and hit the start button. Wait. Consider the end time when you start this so you don't have to wake up in the middle of the night. Yes, I've woken up at 4am to put the cups in the fridge. When the yogurt maker is finished and beeps, place individual lids on each cup and put cups in the refrigerator for at least three hours before eating. It was a definite improvement on previous times I made yogurt. The consistency is not perfect but it's consistently inconsistent, which makes it completely edible. The kids didn't flinch. The flavor is very close to my favorite yogurt. I'm feeling more confident than when I started, but I still don't know why it's not as creamy as the grocery store brands. I'd love to hear your thoughts. Have you made yogurt? Did you get the consistency down? Would you share your secret with me? My breakfast: Whole milk yogurt, blueberries, cinnamon, and sunflower seed butter.